Why don’t gas clouds in space dissipate? During the live video chat on Sunday, I was asked a good question: why don't nebulae, gas clouds in space, dissipate? What holds them together? The basic answer is: gravity. The clouds aren't like clouds on Earth, or balloons filled with air; nebulae are immense objects with vast amounts of mass. Their own gravity holds them together, and can even cause them to collapse and form stars. And wouldn't you know it, this goes against claims made by creationists that stars can't form from gas clouds, so I included that as well in the video. 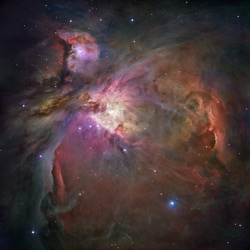 The images in the video, if you're curious, are of the Orion Nebula (seen here too), very young stars forming in the Orion Nebula, and an artist's drawing of a young planetary system still forming.